January is the best time to buy citrus fruit. Use juicy, fresh lemons in this rice pudding that is made on the hob and cooks in just 35 minutes. Place the rice, sugar, lemon zest and juice, sultanas and 450ml cold water in a medium saucepan. Slowly bring to the boil and simmer, uncovered, for 25 minutes, stirring occasionally. Stir in the evaporated milk and simmer for a further 5 minutes, continuing to stir occasionally. Preheat the grill to hot. 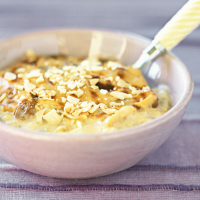 Pour the rice pudding into a warmed heat-resistant 1-litre serving dish and sprinkle with the flaked almonds. Place the pudding under the hot grill until the almonds are toasted, being careful not to let them burn. Alternatively, simply sprinkle with toasted flaked almonds and don't grill. Serve immediately. If making this pudding in advance, increase the water to 600ml in Step 1. Reheat on the hob, then add the almonds, as in Step 3. Alternatively, reheat the pudding in the microwave on medium power using the manufacturer's guidelines, before adding the flaked almonds.